Welcome back to Tombstone Tuesday! After a break for a couple of weeks we’re back to visiting the Altman family in Anselm Lutheran Cemetery. Today we’re looking at my great grand-aunt, Augusta Christine (Altman) Froemke. Augusta Christine was the fourth of thirteen children of Christian Gottlieb Altman and Christina Frederika Sofie (Kolbe) Altman. She had five brothers (two older and three younger) and seven sisters (one older and six younger). 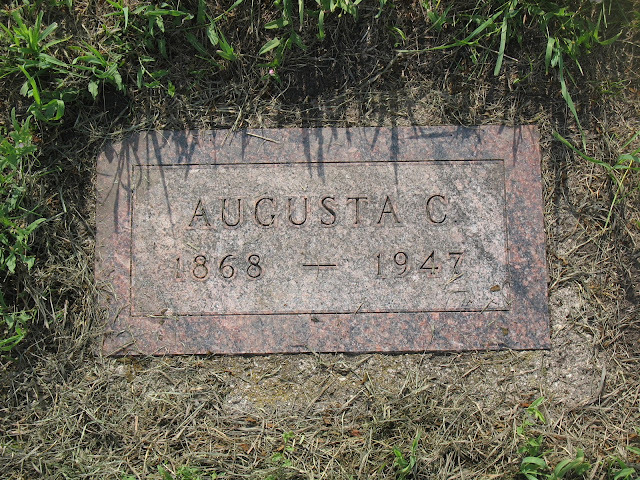 Augusta Christine was born 2 August 1868 in Waumadee, Buffalo, Wisconsin. She married Carl August Froemke, Jr. on 4 July 1888 in Lisbon, Ransom, North Dakota. Together they had thirteen children (seven boys and six girls). She died 5 August 1947 in Shenford Township, Ransom, North Dakota. She’s buried in Anselm Lutheran Cemetery in Anselm, Ransom, North Dakota. The cemetery borders what used to be family farmland. 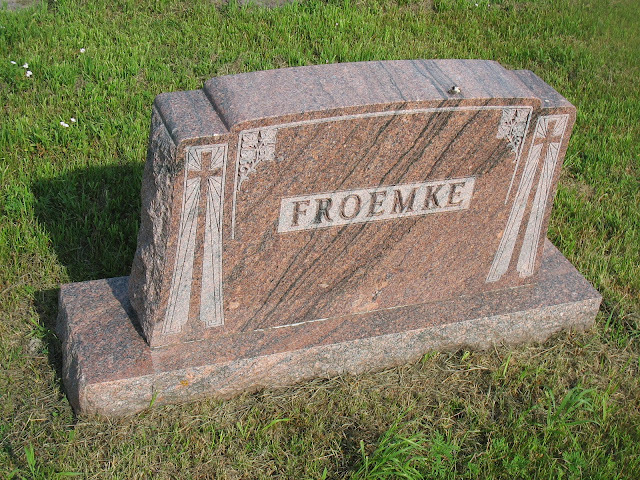 Technically we're not related… Myrtle Nohr's husband Fred Krentz was my great-uncle… but we're Anselm Cemetery cousins. I've sent you the link to my blog, where you'll find some tasty morsels of Altman & Nohr & Froemke family history. Welcome to the blogosphere! Ooooo, cousin bait! How exciting. I'll be sure to go look at the goodies you've sent me. Thanks for stopping by!